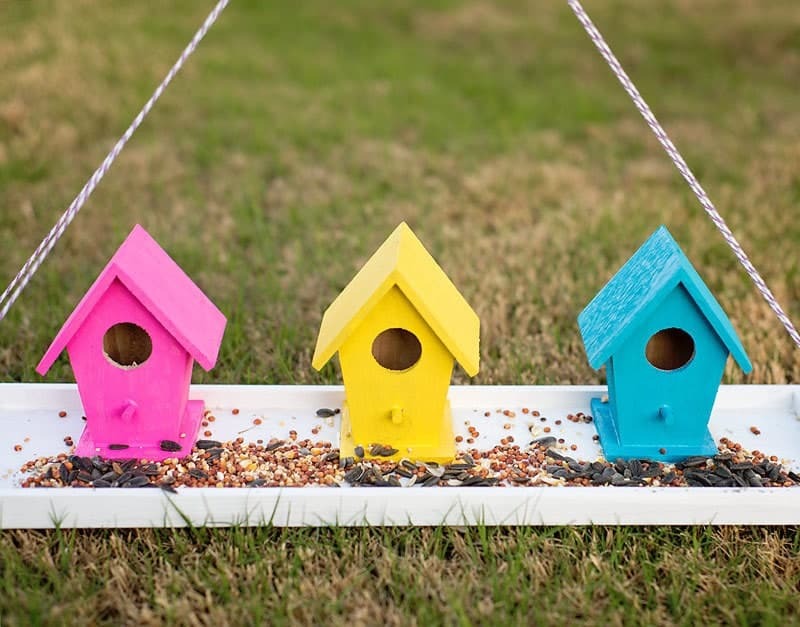 See how to make a Bird Feeder for your garden! 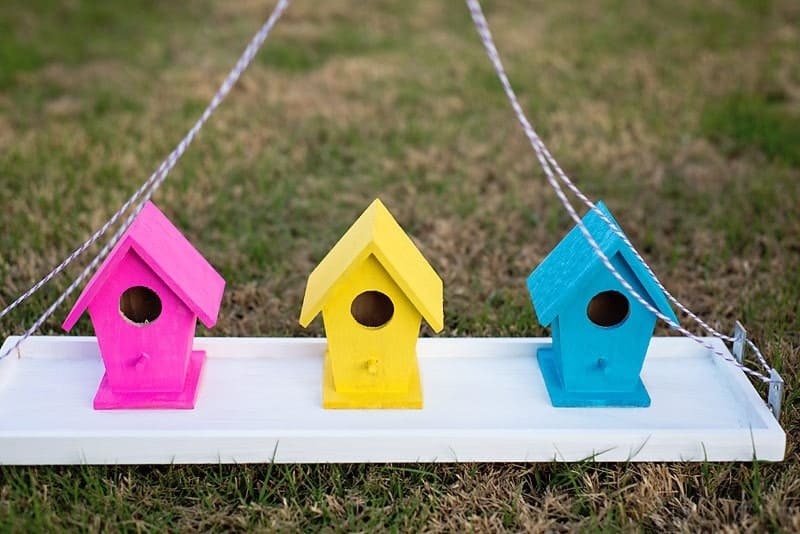 This adorable, colorful painted DIY Bird Feeder is the perfect craft for spring. This is a sponsored post written by me on behalf of The Gorilla Glue Company . All opinions are 100% mine. If you’ve been reading for a while you probably know we sold our long-time home, last year. One of the things I miss most about the old house (other than all the room – our rental is pretty small in comparison) is the little side garden area we called the “bird sanctuary”. We gave the area that name kind of as a joke, as it wasn’t very fancy looking, (we’ll call it rustic, lol) but the name stuck. We had so many birds; it really was an amazing bird watching area. The garden backed up to a copse of Cedar trees (we left these in place to block the view of the neighbor, smartest decision ever!) The garden had several bird feeders, a bubbling fountain plus tons of colorful (deer resistant) flowers that always attracted butterflies. I loved sitting out on the porch watching all of the different birds throughout the day – Cardinals, Lesser Goldfinches, Red House Finches and best of all we had a couple of Painted Buntings that visited all the time! Needless to say, I’ve really been missing my birds! Hubby loved them too; in fact, he got permission from our current landlord to install a small flower garden in the backyard of our rental and in the final months of the summer last year, it was so pretty. Full of purple Salvia, yellow Lantana, and red Fire Bush- everything bloomed like crazy all the way through the first of November. After a long cold winter, our new little flower garden is looking pretty sad. The Knock Out Roses and Crepe Myrtle are coming back but it looks like the freeze got everything else and will need to be replanted. The weather is warming up and I’ve been seeing some bird activity, so it’s definitely time to get bird feeders up. My lil missy and I were brainstorming different ways we could dress up the garden for spring since it’s still too early for the flowers to bloom. Both kids love spotting and identifying all the different birds too, so we decided to make our own colorful DIY bird feeder to attract more birds this year. I don’t really like to mess with tools, (I leave that to the hubby, lol.) I knew our DIY Bird Feeder needed to be something easy we could put together with just a bit of glue and paint. 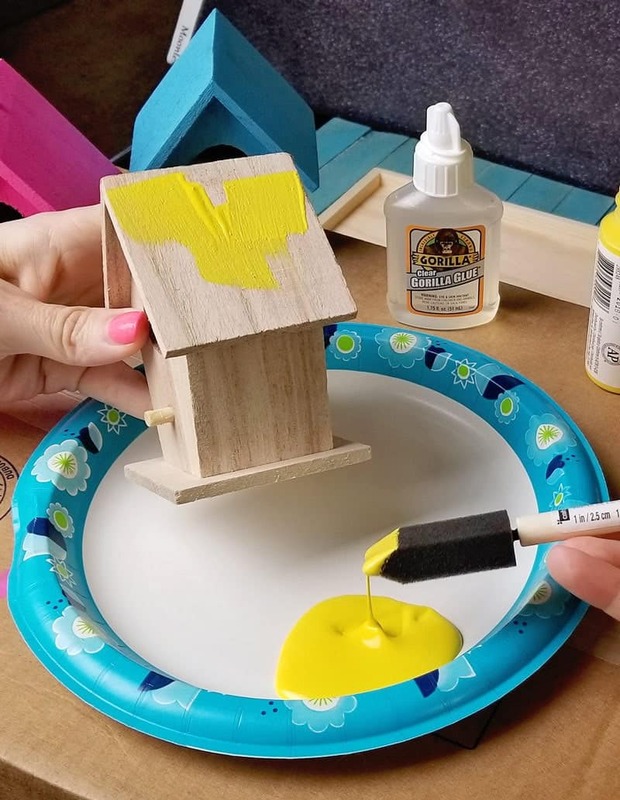 After browsing around at Home Depot and various craft stores, we decided to use the dollar birdhouses and paint them bright colors to help liven up the area and hopefully attract more birds. When it came to the glue, we needed something that was really strong, would hold up to the outside elements and would dry clear. 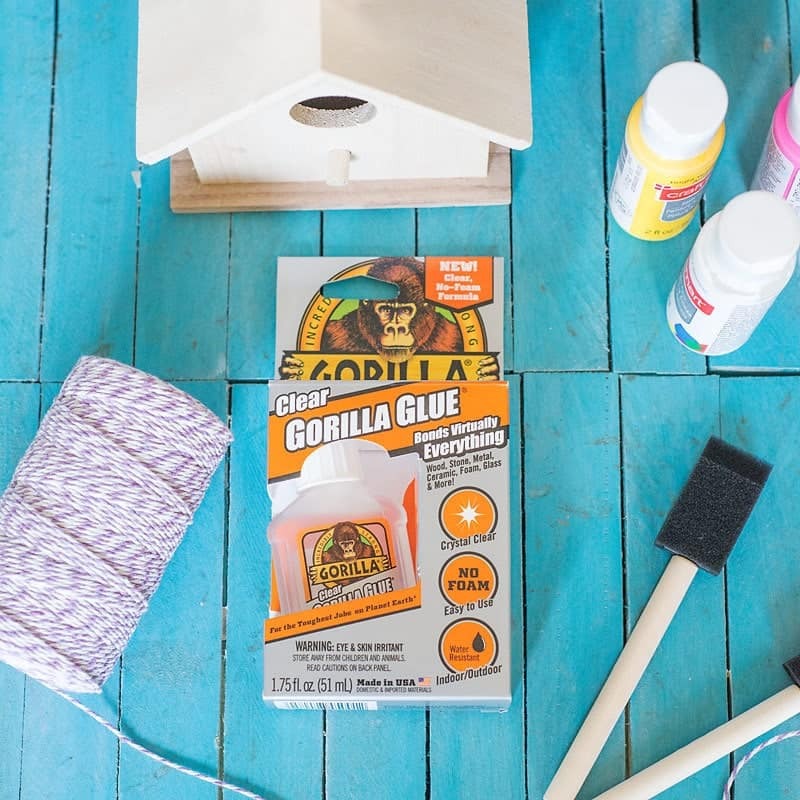 Gorilla Glue® has a new Clear Formula that’s perfect for projects in which you don’t want any glue showing. (Like adhering glass to metal, use on mirrors or any other project where you don’t want visible glue.) The best part is the Clear Gorilla Glue® dries crystal clear, is non-foaming and water resistant. It’s easy to use is incredibly strong and bonds to virtually anything! 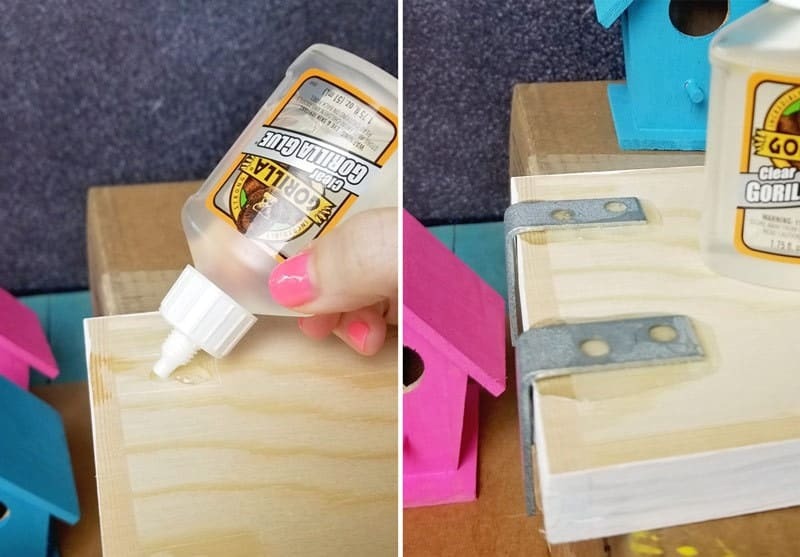 Since we are painting the bird feeder such pretty bright colors, we didn’t want any glue showing where we attached the little birdhouses or the L brackets. Clear Gorilla Glue® doesn’t foam or expand as it cures, making it the perfect choice for this project. 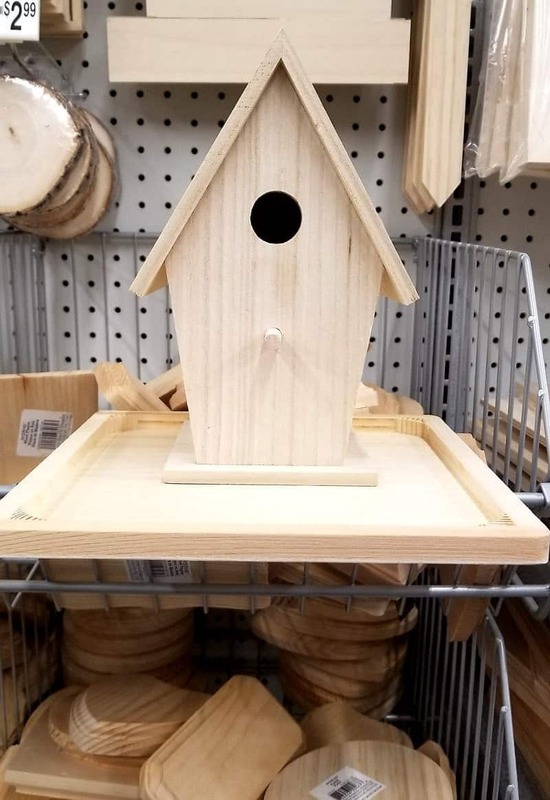 Ready to make a bird feeder? Step 1: Paint birdhouse(s) and tray. Let paint dry. Step 2: Mark were the L brackets are going to go and glue to the bottom of the tray. Let dry. Step 3: Add glue to the bottom of the birdhouse(s) and press firmly into place on the tray. Let Dry (according to recommended time on the Gorilla Glue® instructions. Step four: run a piece of twine or string through the holes of the L brackets and tie into a square knot, adding a dot of Clear Gorilla Glue® to secure the knot. Let Dry. That’s it, you are done. Hang your bird feeder and watch the birds eat! Now it’s your turn! Share your favorite way to brighten up your garden before the flowers start to bloom in the comment section below and be sure to fill out the entry form for a chance to win a $250 Home Depot Gift Card from Gorilla Glue®! I like to clean everything out and and bright colorful led lights to it so at night it glows up. I love easy, inexpensive projects, that give you instant gratification. Soooo cute! Oh what a fun idea! This is a cute project! Unless you are hanging this bird feeder in the dry (under a porch/ overhang), I would recommend making some small drainage holes in your tray. Good idea! If we could only we could get some rain around here, I might have figured this out on my own, lol! I love your project! It’s so bright and happy! I need to put some more mulch in my front flower beds to spruce them up a bit. I’m a beginner gardener, so still just learning all the tips and ideas! This is adorable, and I love how you don’t need a bunch of power tools. I’ve not yet tried Gorilla Glue, but do have things I need a glue like this. I can’t wait to try it! I like to brighten my garden with some wind spinners. I love creating things for my yard to treat the birds,butterflies for Spring.Despite our still some days of light snow surprises, for the most part we have bloomed flowers and green grass with the arrival of hummingbirds here in eastern Tennessee. I’ve already started placing my feeders for the humming birds out side. And I enjoy making my own from glass bottles such as wine, soda, or even recycled vinegar bottles. I love to hand paint on them, then add copper wire twirled around them, and add the feeding cork to the ends. This new #Gorilla #ClearGlue would be ideal to add cutouts to the bottles sides to keep them in place and hold strong. Thank you for the introduction to the new product. I love your trio of the wooden birdhouse feeders in the hanging tray. I will making some of those to enjoy for my finches that visit my yard. I so enjoyed this #DIY shared post. Thanks Jamie and have a blessed Easter Sunday tomorrow. This looks like fun! We have bird feeders that we bought and my sons would love to make one. I have heard of Gorilla Glue but have not tried it. It sounds great if it can hold up! Cute project. I put up my tiny picket fence and some tiki torches in the spring. Super cute craft and makes me dream of warmer weather despite our spring cold/snowy weather. I am a beginner, but think I could manage this with my kiddos. Fun! This is adorable! Would make a great gift for the grandparents. Love this, we need to make some bird feeders! My kids and I paint kindness rocks. Some we display are ours and others are works of art we found out on our journey and errands created by others. I hang my hummingbird feeder, and put out my glass butterfly dish. It’s a beautiful blue glass, and has a yellow sponge I fill with nectar, for them to feed on. We’re supposed to get a foot of snow today in northern Michigan, I’m SO ready for spring!! Adorable! I am going to try this project! Gorilla Glue is an essential at our home. We have lots of birds in our back yard and this would be a great project for my kids. We are in the process of cleaning up our back yard and soon planting some more grass. I really like how those colors pop! Very simple, modern, and fresh! I always kick off spring by hanging colourful lights on my deck and putting my decorative garden pieces out in the frint flower bed. Would love to add these in my backyard!! I so woild love to make these beautiful birdhouses! I have a front porch area that would be perfect for these. I’m planning on cleaning up the area where I keep my birdfeeders this weekend. Planting flowers and building a rock wall around the garden. I enjoy watching the birds come to the feeders and birdhouses. I honestly don’t have a garden, no room where I live, but my mom has one and she LOVES birdhouses! This is so cute!! super creative! thanks for the tips. I am planning on installing a birdfeeder on a pole in the front yard later this month. Interesting read. Gorilla Glue is Elmer’s glue of the craft world! 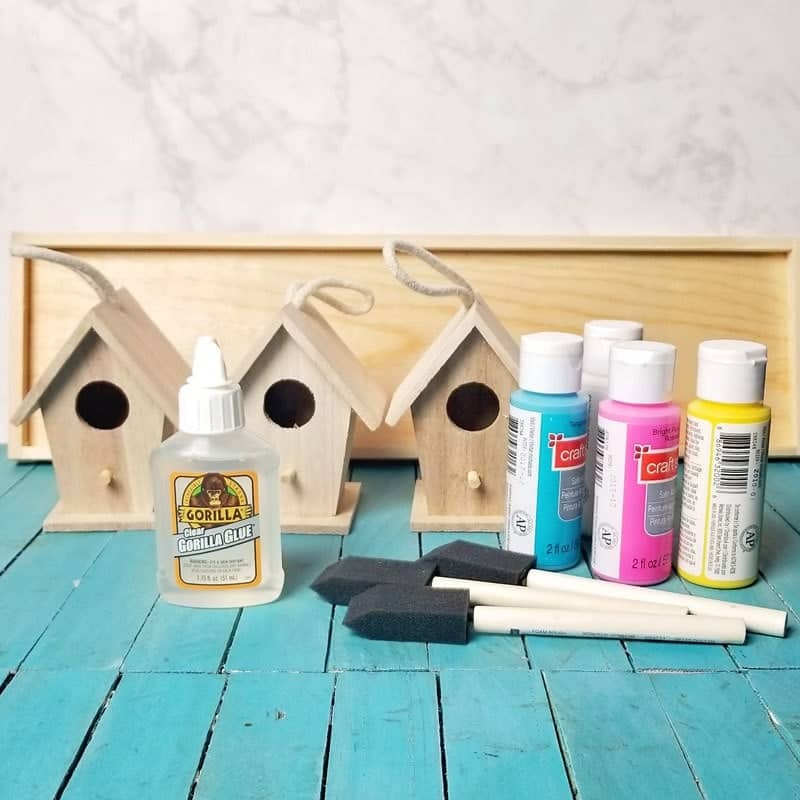 I love doing crafts and these little birdhouses are super cute! Gorilla glue has so many great uses. I need a bird feeder in my yard. This would be so much fun to make as a family project. We recently moved into a new house now I’ve got to get it spring and summer ready. I want a flower garden and a veggie garden. It’s the time of the year to clean up the yard, trim sharps and plant flowers. I can’t wait to do this project. 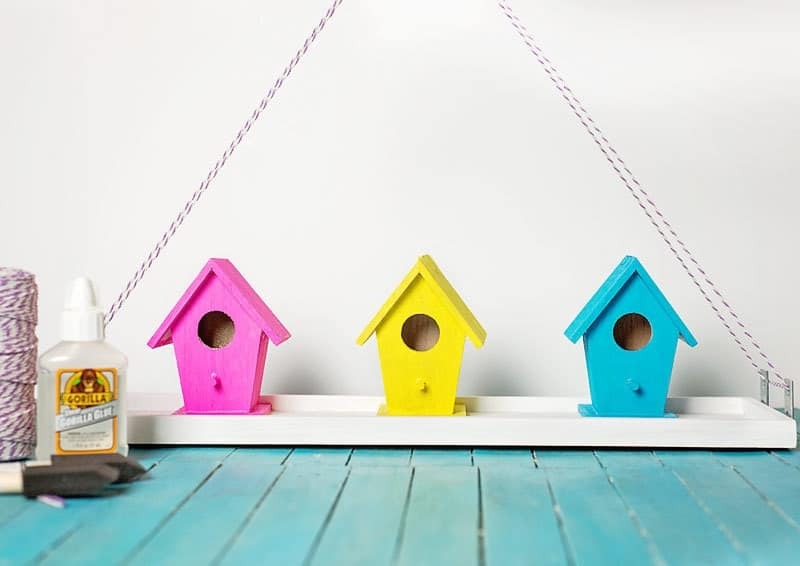 The colorful birdhouses will brighten up the yard. I love bird watching. I Like to brighten my garden with different kinds of planters, flowers, garden signs, bird feeders and bird baths for the spring! I also love comfy chairs and cute functional tables so we can hang out in the garden and enjoy the flowers and vegetables and the birds, bees, butterflies and whatever else comes into our garden. 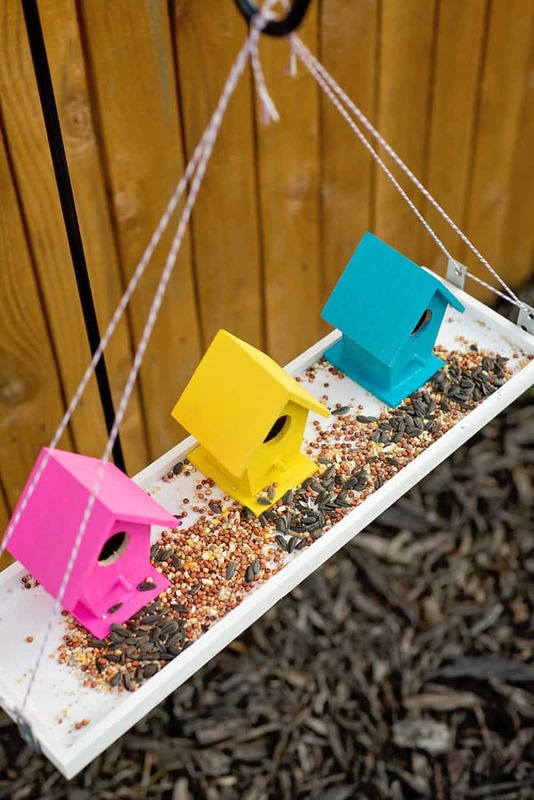 I Love your DIY birdfeeder as it is so cute and pretty easy to make being no tools necessary! Thank you for sharing this great post on how to make this super cute bird feeder and for this wonderful giveaway! I hope you have an Amazing Spring! This is so awesome. Will be doing this with my kids. Awesome giveaway. I’m trying to make my backyard into a great place for wildlife. We just bought a house on 4 acres and have tons of landscaping to do. I love my yard lawn ornaments and wind chimes. Perfect for all of my paint projects!! This is such a cute craft for spring time. Thanks for the blog post! I discovered Gorilla glue a few years ago. It is an amazing product. It really works. I highly recommend it. 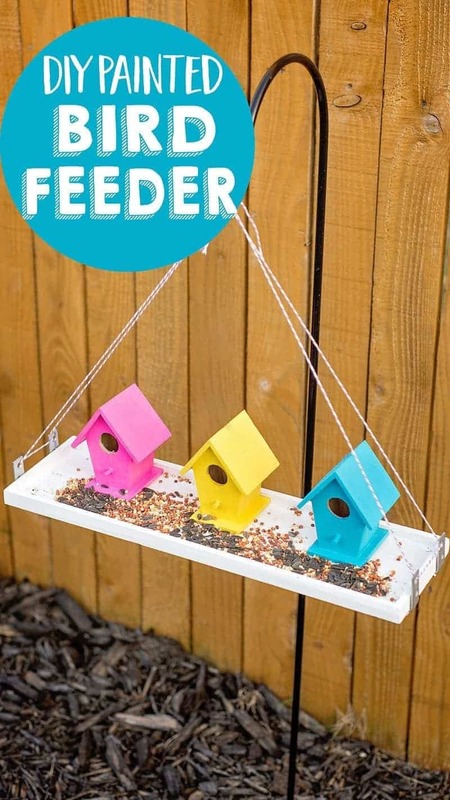 Cute bird feeder idea! 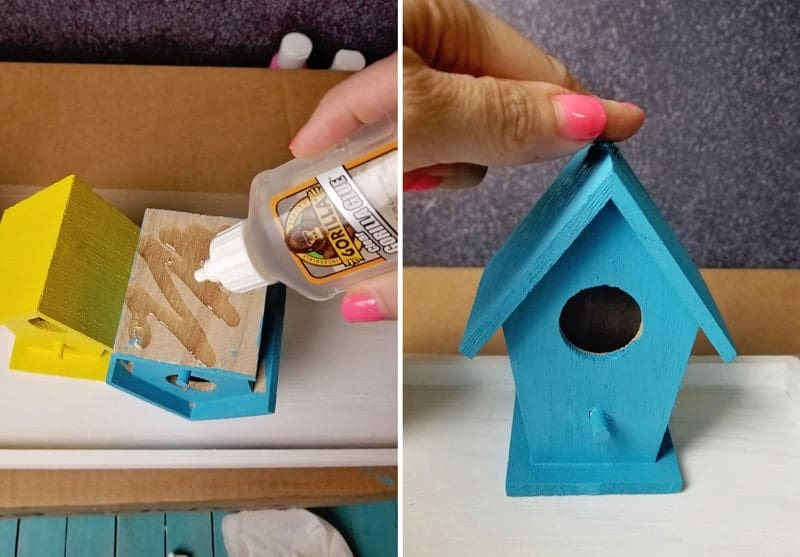 Before my flowers start to bloom I like to get everything cleaned up and I place brightly colored stones in my garden that I have painted myself.This DIY birdhouse would be a welcome addition to my flower garden.I can’t wait to make it! I need to get this Gorilla Glue to put pennies on the roof of a bird house. I love bird watching. This is super cute. Thank you for the opportunity. I turned my dog who passed water bowls into bird baths. It’s more of a memorial garden. The flowers brighten my day just as he did. My brother just got a new house and I think can use these ideas! What a cute idea! My elderly neighbor would love this for her backyard. She has the most wonderful birds and butterflies there. I have a new project…..Thanks for sharing.! I let my grand kids each paint one rock, big or small, to look like an animal of their choice. So in addition to a flower garden we have an animal rock garden and the kids LOVE it. This is definitely going to be a cute.Weekend project to do to brighten up the yard. Thanks for sharing. Thank you for sharing this idea. It is something so easy to do with the kids. Thank you also for the giveaway. I like to put in a garden and tidy up the yard. We’ve been wanting a new bird feeder. What a fabulous craft to do with the grandkids. Thanks for the idea. Love this! So colorful and unique. My feathered friends need this. I like to make bright, decorative signs to go in the yard and I always spruce up my mailbox. Our favorite way to brighten up our garden is by letting our kids paint the rocks around our rock garden! We also put in fun little hard ornaments! My granddaughter and I would love to work on this project.. so easy and fun! After Cleaning out the dead and dried up “debris” from the winter months I always brighten up the yard with Colorful Metal Solar Lights and ornamental outdoor accessories….even the front of my house gets New or updated Decorations with LOTS of Color to make them “pop” right along with the flowers that are starting to bloom. I want my yard to be a bright, colorful and happy spot on the block for everyone to enjoy that passes by.. I can’t wait to try and make one. I love these projects they are fun and ;you can include kids in the project. Very cool. Thanks for the sharing. I love this idea. I always feed my little feathered friends and this is adorable. Awesome I’m going to make one of these for my garden!!! Such a cute idea! I got a hummingbird feeder for Christmas,so I’m excited to put that out. I also can’t wait to plant flowers and work out some projects outdoors that I’ve been wanting to finish. I love this diy project. My son loves bird and this is perfect for him. We had a hummingbird feeder. It was so nice watching them come to the feeder. It became a very busy place. But then the wind knocked it down and we haven’t put it back up yet. Our birds would love this! We’ve been getting cardinals and chickadees for the last month, and an occasional tiny parula. We love feeding the birds. This project is so cute and we have a protected area to hang it. Thanks! I put out a giant 6 ft metal flower! It’s metallic blue so even if it’s a while before real flowers bloom, I still have something pretty to look at. My little nephew and of course his family just moved into a new house. I will have to help him to make this for the back yard. I add colorful hanging baskets amid the bushes in a raised garden. I also have a couple of fun painted wooden planters (wheelbarrow, bridge), a gnome, hand painted stepping stones, and a few cute frogs! This is a cute project. Fun being able to use a glue that won’t expand. I’m thinking of updating our garden fence with a fresh coat of paint this year. Perfect project for my kiddos! They love watching the birds in the yard, making something like this will definitely attract more! I will be making this project with my 5 yr old grandson this summer. Thank you for the wonderful idea and instructions. I have a new deco flag and some awesome colored pots waiting for this year’s annuals to be planted..so they are our color for now? Great easy project to do with the kids. I need to get this Gorilla Glue! This would be so fun to do with my kids! I would love to do this with my son and daughter!! This is a great way to add a pop of color. I. Would love to make this with my 6 yr old daughter. She loves arts and crafts. I love these bird houses! Such a fun craft and not a lot of money! I cant wait to make this with my nephew and daughter. Thanks for the chance! I like to hang bird feeders and use other lawn art around the pots to make it look nice. Grandkids will enjoy this, especially the bright colors.